In the past decade, two features have characterized the American job market: wage inequality and persistent unemployment. There is little doubt about the basic facts: Wage stratification has become more pronounced, and far too many people remain unemployed. However, there is debate about the causes. Two interpretations have been very influential: that inequality is driven by demand for skills that are out of reach of many workers and, in a similar vein, that persistent unemployment is caused by a mismatch between what firms seek and what potential employees can provide. While skill requirements are real—a strong back no longer suffices—the skills manufacturers seek are at the community college level or below, well within the reach of the vast majority of Americans. 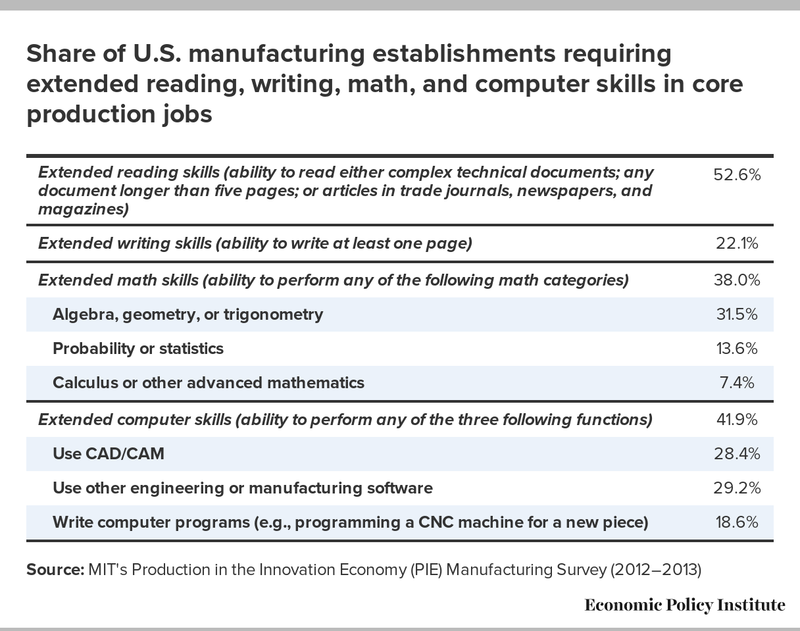 The demand for some basic skills is extensive, although fewer than half of manufacturing employers seek the full complement of basic reading skills (defined as the ability to read basic manuals), basic writing skills (the ability to write short notes), and basic math skills (the ability to add, subtract, multiply, divide, and handle fractions). While 38.0 percent of manufacturing firms require extended math skills, the level of math that is expected is within reach of a good high school or at most community college education. Only a minority of manufacturing establishments report difficulty recruiting the employees they need. Nearly 65 percent of establishments report they have no vacancies whatsoever, and 76.3 percent report they have no long-term vacancies (in which jobs have remained unfilled for three months or more). Persistent unemployment in the manufacturing sector is more likely driven by inadequate demand than by any form of mismatch. Manufacturing offers a number of compelling features as a subject of investigation. First, it makes sense to examine data within an industry sector given that intra-industry variation accounts for the majority of both unemployment changes and skill upgrades (Lazear and Spletzer 2012; Modestino 2010). 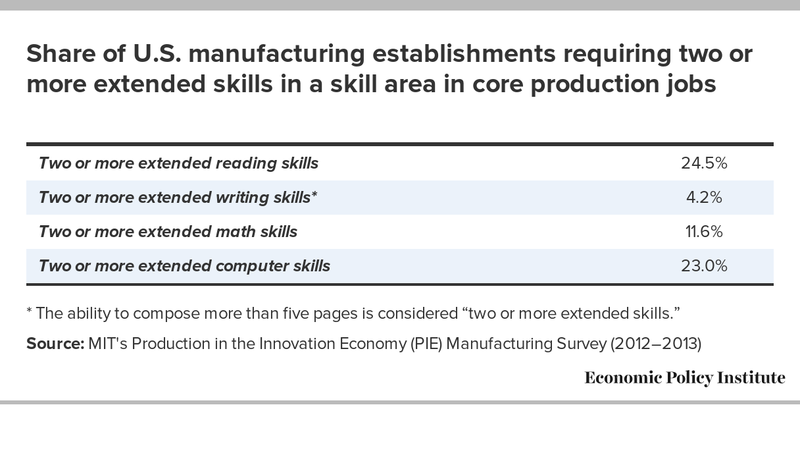 In addition, arguments about skills mismatch are frequently applied to manufacturing. A 2011 survey conducted by the National Association of Manufacturers (NAM) and Deloitte reported that 74 percent of manufacturers stated that a lack of skilled production workers had had a “significant negative impact on [their] company’s ability to expand operations or improve productivity” (Deloitte 2011). Many journalists and policymakers have echoed these complaints in various contexts (Portman 2013; Emanuel 2011; Hemphill and Perry 2012; Friedman 2012; Baden 2011). However, it is important to note that other economic data do not indicate a skills gap. Most tellingly, wages for manufacturing production workers—particularly those with the highest levels of training—have not increased as would be expected if a skills shortage existed in the manufacturing sector (Osterman and Weaver 2014; Rothstein 2012). A further reason for examining manufacturing is that it is a generally capital-intensive sector that is sensitive to technology shocks. Because some of the key theories about sources of mismatch-generating shifts in skill demands and supplies involve technology shocks, manufacturing is a logical place to look for these effects. On a related note, manufacturing is also a sector where technical skills—such as computer and math skills—are thought to be important. Given that these skills are often at the center of the skills debate, manufacturing provides fertile ground for inquiry. Finally, despite its recent troubles, the manufacturing sector remains of interest due to its size and characteristics. It accounts for 12 percent of GDP, and it is responsible for about 70 percent of industry research and development spending (Bureau of Economic Analysis 2013; Ezell and Atkinson 2011). As a broad sector with substantial variation (high-tech versus low-tech, domestic versus export focus, etc. ), it provides a productive test case for the exploration of skill demands and skill gaps. Most discussion around skill requirements focuses on educational attainment, but education is an imperfect proxy for concrete skills. In addition, there is a fundamental identification problem associated with using education as a proxy for skills. For example, if we observe that the education level of a group of incumbent workers in a given occupation is rising, it is unclear whether this reflects an increase in the skill demands of the job, or instead simply an increase in the educational attainment of the available workforce for reasons unrelated to actual job requirements. Research on skills that moves beyond educational proxies is fairly thin and is almost non-existent if we look for nationally representative data on employers. David Autor, Frank Levy, and Richard Murnane (2003) use the Dictionary of Occupational Titles, a federal government effort to map skills for a number of occupations, to examine how the diffusion of information technology affects skill requirements. Their focus is on the distinction between routine and non-routine work, and they argue that computers are increasingly taking over routine tasks, leaving humans to do either high- or low-skill non-routine jobs. However, while it is clear that the computerization processes that Autor, Levy, and Murnane describe have altered the labor market, there is considerable doubt about the magnitude of the shifts and whether this transformation is the type of discontinuous change that would drive gaps between the supply and demand for skills. Other researchers have examined skill changes and found them to be either modest or manageable with current workforce capabilities. Michael Handel (2007, 2008) finds a steady growth in skill demands but no evidence of acceleration in recent decades. For example, Handel concludes, “Overall, it seems that rather basic levels of math, corresponding to two years of ordinary high school instruction, are sufficient for most jobs.” However, his survey is based on the responses of individuals who report what they do at their jobs, as opposed to reports by employers. There is some research on skill demands in specific firms. For example, Roberto Fernandez (2001) studied these issues in the context of a technological change in a food processing factory. The factory completely redesigned its production process in order to implement continuous processing and control systems. Fernandez collected numerous direct measures of skill changes, and these do show generally increased skill demands in the new jobs, although the increases are not radical. However—and this is very important—the firm kept its workers and retrained them despite the average education level at the plant being below 12th grade. The fact that existing workers could be successfully retrained to use modern production technologies casts some doubt on the existence of the skill shortage problem. In short, when it comes to understanding skills, we want to know what skills are needed and what we can say about the existence and characteristics of any mismatch between the supply of and demand for skills. Our survey results provide some of the first nationally representative, concrete evidence on these questions with regard to manufacturing establishments. In 2012–2013 we conducted a nationally representative survey of manufacturing establishments. The survey asked broad questions about the establishments, but when it came to employment topics we focused on core employees, defined as the group of employees who were most central to the establishment’s production. Examples of these employees’ job titles are manufacturing associate, fabricator, assembler, production technician, and process operator. We asked very specific and detailed questions about the employers’ skill requirements. In addition, we asked about their experiences in recruiting and hiring the employees they need, with a particular focus on whether employers were experiencing long-term vacancies that they were unable to fill. More technical details regarding the survey are in the appendix to this brief. Before presenting our findings, it is important to note that they do not contradict the view that education and training are important for individual success and employer productivity. We certainly support continuing investments in human capital. Indeed, our findings are supportive of these investments because they suggest that the skill levels required by manufacturing establishments are readily obtainable. We began by asking about basic skills and then turned to more extended job requirements. We defined basic reading skills as the ability to read basic manuals; basic writing skills as the capacity to write short notes; and basic math skills as the ability to add, subtract, multiply, divide, and handle fractions. We asked an additional question regarding the frequency of computer use. The results in Table 1 certainly do suggest that basic skills are important for core employees in most manufacturing firms, with 75.6 percent of firms requiring basic reading skills; 60.5 percent requiring basic writing skills; 74.0 percent requiring basic math skills; 42.4 percent requiring the full complement of basic reading, writing, and math skills; and 62.3 percent requiring computer usage at least several times a week. However, a large segment of employers do not require the full range of basic reading, writing, and math skills, or regular computer usage. The data on extended skills displayed in Table 2 contain a number of interesting results. First, although demand for reading and math skills is comparable at the basic level, at the extended-skill level, reading is in greater demand than math (at 52.6 percent versus 38.0 percent). 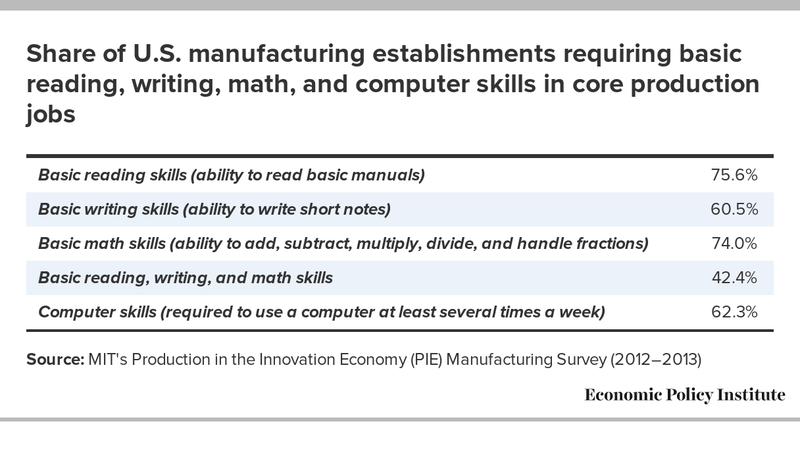 Extended math and computer skills are both very important, but less than half of manufacturing establishments require at least one extended skill in these skill bundles. With regard to the 38.0 percent of establishments that do require extended math skills, it should be kept in mind that the level of additional math that is expected (beyond the basic skills described previously) is within reach of a good high school or at most community college education. In breaking down this bundle, 31.5 percent of respondents said that employees should be able to use algebra, geometry, or trigonometry, while for statistics or probability the figure was 13.6 percent, and for calculus or other advanced mathematics it was 7.4 percent. Table 3 provides another perspective on extended skill demands by examining the share of firms requiring two or more extended skills in a skill area.1 Among other things, it shows that 11.6 percent of firms require proficiency in two or more types of math; for example, a firm might require proficiency in trigonometry, statistics, and calculus. Overall, requirements for extended skills are often limited to particular skills. The reductions in the percentages requiring two or more skills within a skill area indicate that it is not the case that establishments that demand one extended skill in, say, math, are equally likely to require multiple advanced skills in that same area. This would imply that firms have very specific needs for certain advanced skills. These specific needs may be more amenable to training than would broad-based requirements for competency across many advanced skills. Table 4 presents the results for two characteristics that are often referred to as “soft skills”: cooperation and teamwork. About 81 percent of manufacturing firms said cooperation with other employees is “very important,” while around 64 percent said the ability to work in teams is “very important.” Here the message is clear: The typical manufacturing firm places substantial weight on these behavioral traits, which in turn suggests that the widespread discussion about the importance of soft skills has a strong basis in reality. Are employers having trouble finding the people they need? The answer to this question is important for understanding how to help employers improve their performance and, as we emphasized earlier, for interpreting the persistence of high unemployment in light of some claims about mismatch. Data on the “hiring funnel” do not point to problems. In our survey, the median time employers reported to identify a prospective new employee and make an offer was four weeks; more than 90 percent of establishments reported that they were able to identify a candidate in 12 weeks or less. Once a candidate is identified, establishments seem to have little difficulty in actually hiring the person, with the average acceptance rate being 86 percent and the median 95 percent. To understand where the problem with hiring might lie and what the characteristics are of firms that face challenges, we asked two questions about vacancies. First, we asked about the number of current vacancies, and second, about the number of long-term vacancies in which jobs remained unfilled for three months or more. The distribution of the replies is shown in Figure A. Like the survey responses on skills, these data show some clear, broad patterns while at the same time displaying diversity. The strong majority of manufacturing establishments simply do not have a problem recruiting the employees that they need, and this should be no surprise given the current state of the job market and wage trends. Nearly 65 percent of establishments report they have no vacancies whatsoever, and 76.3 percent report they have no long-term vacancies. There is, however, a subset of establishments that report problems in the form of extended vacancies. Overall, about 24 percent of establishments report some level of long-term vacancy, while about 16 percent report long-term vacancies equal to more than 5 percent of their core workforce. There is no way of knowing if these are the firms whose complaints we hear in the public discussion, since it is in the interest of all employers, regardless of their situation, to beat the drums for more investments in producing a manufacturing workforce. Are vacancies a problem for the establishments that are experiencing them? In addition to long-term vacancies as a measure of hiring challenges, we explored a couple of other measures of potential distress. Although these other measures are not as quantifiable as extended vacancies—some rely on subjective managerial opinions—they can serve as robustness checks on our main findings. We first asked about an alternative response to recruitment problems. For example, it might be the case that some manufacturers are forced to reduce production in response to a skill shortage and consequently, long-term vacancies might not capture the extent of the problem. Overall, 15.2 percent of establishments reported that at some point in the past they had had to reduce production in response to an inability to fill a vacancy for a production worker. Because this measure potentially extends back a number of years, it does not necessarily imply current difficulties. 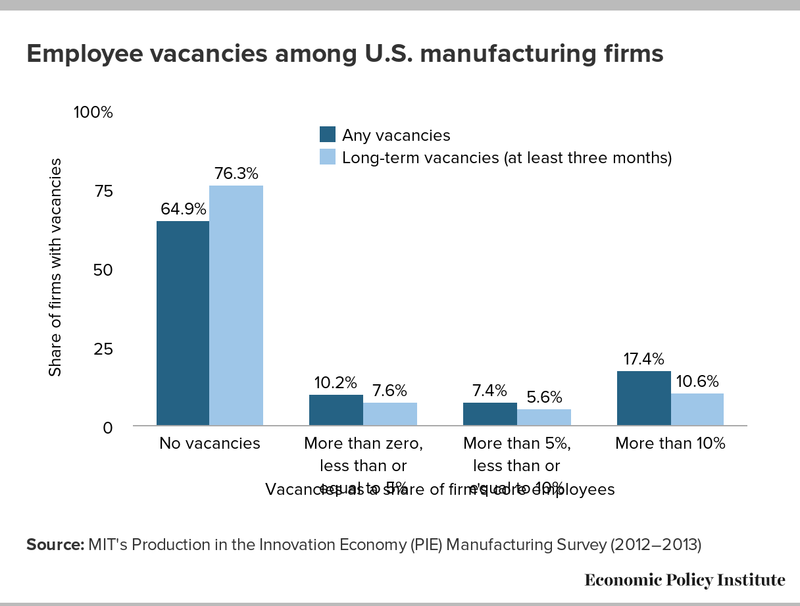 We can partially address this issue by calculating how many manufacturers have any current vacancy (not necessarily long-term) and report at some point having reduced production. Eight percent of the establishments in our survey meet this criterion. We also asked the survey respondents—typically plant managers—whether they perceived skill shortages as a barrier to success. Specifically, when we asked the entire sample whether “lack of access to skilled workers is a major obstacle to increasing financial success,” 16.1 percent responded affirmatively. Notably, this percentage is lower than the percentages reporting that weak demand, taxes, or regulation were major barriers to financial success. These findings are consistent with those of Federal Reserve researchers who report that the Census survey data on management opinion concerning the reasons for underutilization of plant capacity indicate that only around 5 percent of manufacturers cite insufficient labor force skills as a limiting factor (Stahl and Morin 2013). Overall, these additional results reinforce our findings regarding the incidence of skill gaps. As with our vacancy results, these outcomes indicate that while some firms do face real challenges that should be taken seriously, there is no evidence that skill gaps extend widely across the manufacturing sector. We have seen that there is heterogeneity among establishments, with some seeking more extended skills than others and some having more recruitment difficulty than others. What distinguishes these employers? Our results on employer characteristics contain a two-part message: Demand for extended skills is a key predictor of hiring difficulties, but this is conditioned in important ways by other factors, potentially including a firm’s human resource policies and its external environment (e.g., the quality of its relationship with local community colleges). In fact, employers with the very highest skill demands—those classified by the Bureau of Labor Statistics as high-technology—actually had significantly lower long-term vacancies as a percentage of total core workers. In short, high-skill demands are not necessarily a ticket to trouble in today’s economy. There are several headlines from this research. First, while it is certainly the case that over time the skills required of the manufacturing workforce have increased, it is also true that these skills are well within the reach of most people. The current impact of technology does not condemn most people holding unskilled jobs because they have not obtained very high levels of education and training. Secondly, a strong majority of manufacturers are able to obtain the workforce they need. Persistent unemployment in the manufacturing sector is more likely driven by inadequate demand than by skills mismatch. Finally, in the minority of cases where manufacturers experience persistent hiring difficulties, high skill demands by themselves do not necessarily translate into hiring problems. Although high skill demands are predictive of hiring trouble, many of the highest-skill-demanding manufacturers do not experience higher levels of recruiting problems. The research underlying this report was generously supported by the MIT project on Production in the Innovation Economy and the Russell Sage Foundation. Paul Osterman is the NTU Professor of Human Resources and Management at the MIT Sloan School of Management and the MIT Department of Urban Planning. He was formerly deputy dean for faculty and MBA teaching at the Sloan School. Osterman’s books include Economy in Society (MIT Press, 2013); Good Jobs America: Making Work Better for Everyone (Russell Sage, 2011); The Truth About Middle Managers: Who They Are, How They Work, Why They Matter (Harvard Business School Press, 2008); and Gathering Power: The Future of Progressive Politics in America (Beacon Press, 2003). In addition, he has written numerous academic journal articles and policy issue papers on topics such as the organization of work within firms, labor market policy, and economic development. Osterman has been a senior administrator of job training programs for the Commonwealth of Massachusetts and consulted widely to firms, government agencies, foundations, community groups, and public interest organizations. He received his Ph.D. in economics from MIT. Andrew Weaver is currently a doctoral candidate at MIT’s Sloan School of Management. His research focuses on the impact of institutions on economic outcomes for firms and workers. Weaver was formerly vice president at NCB Capital Impact, where he managed a tax credit program that invested in low-income communities, and also served as financial director for a social venture in long-term care. He has helped start a number of inner-city businesses, including a cooperative office cleaning company and a community-based staffing company. Weaver holds a master’s in economics from the University of Maryland and a bachelor’s degree from Princeton University. To test the quality of the data we took two steps: a bias analysis using data available in the Dun & Bradstreet universe on respondents and non-respondents to determine what response biases might exist, and, secondly, a comparison of patterns in our survey with those in the Census Bureau’s Current Population Survey (CPS) in order to assess external validity. We conducted the response bias analysis by using a linear probability model to regress an indicator for completing the survey on indicators for the various establishment size categories, indicators for geographic region, and indicators for two-digit SIC codes.5 The results indicate that the largest size categories of establishments—those with more than 100 employees—were 12–20 percent less likely to respond.6 We employ establishment size weights in our descriptive statistics to correct for these deviations. We also control for employment size in our regression specifications. Establishments in the South were 8 percent less likely to respond than their counterparts in the Northeast. Other geographic differences were insignificant. Out of the 20 two-digit industry SIC codes, five were significantly more likely to respond than the base category of food products, with increased response probabilities in the 8–12 percent range. These sectors were rubber and miscellaneous plastic; stone, clay, glass, and concrete; fabricated metal; industrial machinery and equipment; and electronic equipment except computers. Many of these are establishments in the size category—fewer than 100 employees—that was most likely to respond. Our use of establishment size weights and employment controls should mitigate this issue. To test the external validity and data quality of our survey after the application of the relevant weights, we calculated a number of statistics on the profile of the production workers covered by the survey and compared these with comparable statistics on manufacturing production workers from the CPS. We should note that because the PIE survey is an establishment survey and the CPS is a household survey, we expect some deviation between the two surveys.7 The key question is whether the broad data patterns are similar. Appendix Table A1 contains the comparison data. Note: We have used employment weights for the PIE survey and individual earnings weights for the CPS. We can see from Appendix Table A1 that although there are a number of statistically significant differences between means in the two surveys, the magnitude of these differences is generally modest. Average wages for production workers are quite close, and both datasets show almost identical percentages of female production workers. The PIE survey has somewhat greater union representation among production workers (18.1 percent vs. 13.7 percent). In terms of age structure, the percentages of young (age 30 or less) and older (at least 56 years old) workers were very similar, while the PIE survey reports higher percentages of young-middle-aged workers (aged 31–40) than the CPS (27.5 percent vs. 22.0 percent). The CPS reports a correspondingly greater percentage of older-middle-aged workers. Overall, these differences are modest and imply that the PIE survey is faithfully capturing data on manufacturing production workers and the establishments at which they are employed. 2. For more information on the PIE project and its overall results, see Berger (2013). 3. We excluded these sectors because the industry dynamics associated with quick printers (such as FedEx/Kinkos), small bakeries, and newspaper/book publishers differ substantially from those of other manufacturing establishments. 4. The results presented in this issue brief include additional surveys submitted in January 2013 that were excluded from Osterman and Weaver (2014). 5. We conducted this bias analysis with SIC rather than NAICS codes because only SIC codes were available for the nonrespondents in the sample. 6. Results are available upon request from the authors. 7. We chose to validate our data with the CPS rather than with an establishment survey such as the Bureau of Labor Statistics Current Employment Statistics (CES) survey because the CES includes working supervisors in its definition of production workers. 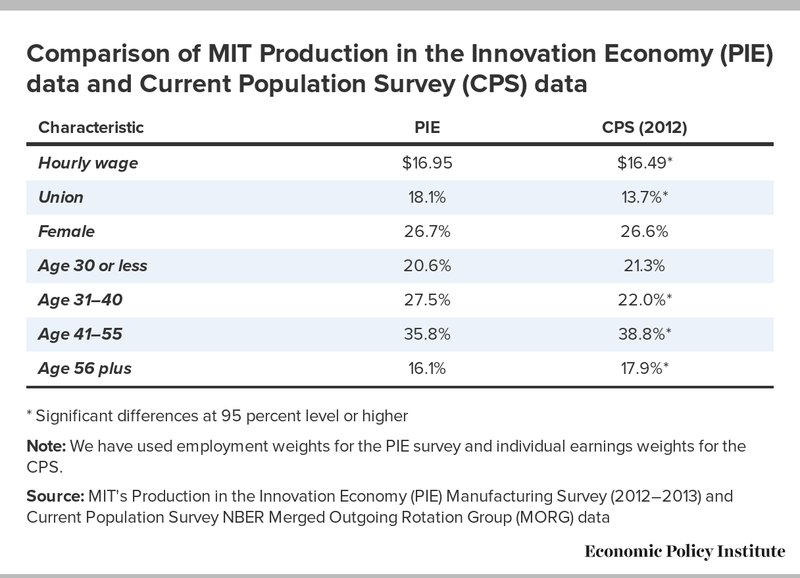 As a result, wages and some other workforce characteristics are not comparable between the PIE survey and the CES. Autor, David H., Frank Levy, and Richard J. Murnane. 2003. “The Skill Content of Recent Technological Change: An Empirical Exploration.” Quarterly Journal of Economics, vol. 118, no. 4, 1279–1333. Baden, Ben. 2011. “Skills Gap Plagues U.S. Manufacturing Industry.” U.S. News & World Report, October 24. Berger, Suzanne. 2013. Making in America. Cambridge, Mass. : MIT Press. Deloitte and The Manufacturing Institute. 2011. Boiling Point? The Skills Gap in U.S. Manufacturing. Emanuel, Rahm. 2011. “Chicago’s Plan to Match Education with Jobs.” The Wall Street Journal, December 19. Ezell, Stephen J., and Robert D. Atkinson. 2011. The Case for a National Manufacturing Strategy. Information Technology and Innovation Foundation. Fernandez, Roberto. 2001. “Skill-Biased Technical Change and Wage Inequality: Evidence from a Plant Retooling.” American Journal of Sociology, vol. 107, no. 2, 273–320. Friedman, Thomas L. 2012. “If You’ve Got the Skills, She’s Got the Job.” The New York Times, November 17. Handel, Michael. 2007. A New Survey of Workplace Skills, Technology, and Management Practices. Working paper. Handel, Michael. 2008. Measuring Job Content: Skills, Technology, and Management Practices. Working paper. Hemphill, Thomas A., and Mark J. Perry. 2012. “U.S. Manufacturing and the Skills Crisis.” The Wall Street Journal, February 27. Lazear, Edward P., and James R. Spletzer. 2012. The United States Labor Market: Status Quo or a New Normal? National Bureau of Economic Research Working Paper 18386. Modestino, Alicia Sasser. 2010. Mismatch in the Labor Market: Measuring the Supply of and Demand for Skilled Labor in New England. New England Public Policy Center, Research Report 10-2. Federal Reserve Bank of Boston. Osterman, Paul, and Andrew Weaver. 2014. 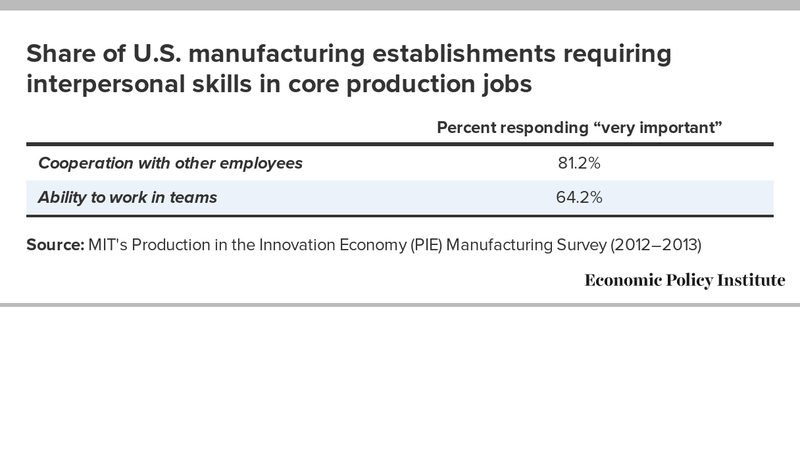 “Skills and Skill Gaps in Manufacturing.” In Production in the Innovation Economy, edited by Richard Locke and Rachel Wellhausen. Cambridge, Mass. : MIT Press. Portman, Robert. 2013. “Closing the Skills Gap.” Chillicothe Gazette, May 10. Rothstein, Jesse. 2012. “The Labor Market Four Years into the Crisis: Assessing Structural Explanations.” Industrial and Labor Relations Review, vol. 65, no. 3, 467–500. Stahl, Jessica, and Norman Morin. 2013. “Looking for Shortages of Skilled Labor in the Manufacturing Sector.” Feds Notes, September 26.